In Rails, ActiveRecord allows you store and retrieve data structures like arrays and hashes in a single string or text-type database column through application-level serialization. This is all fine n' dandy until you're like, "I want to find all posts tagged with either 'hobbits' or 'gandalf'!" Well.. This approach builds a WHERE condition and matches against the given tags, which grows and becomes increasingly inefficient as the number of searched tags increases. Also, if you have tags like gandalf and gandalf-the-grey, you'd get false positives with the above example. While passable for simple cases, there's got to be a better way! Fortunately for us, along comes Postgres. Postgres has built-in array-type columns, which we can take advantage of in our Rails 4.X apps with the postgres_ext gem. What does this mean for our Rails apps? If we can store arrays in a single database column, then our database and application have the same understanding of the structure of the data. This isn't possible with the out-of-the-box serialization model. Most importantly, we can use SQL to effectively search inside our array-type columns. As mentioned, one of the primary benefits of Postgres's array-type column is the enhanced searchability through array-specific SQL. The Postgres Extensions gem unlocks a number of array operators and functions for usage in SQL strings. Let's take a look at operators in both their SQL and Arel forms. If you're unfamiliar with Arel, check out this post where I expand on its usefulness. The overlap operator (&&) is useful when you're comparing two arrays to see if they share one or more elements in common. These queries would return any posts having either 'hobbit' or 'gandalf' as a tag. The contains operator (@>) is useful when you're looking for arrays that contain all the elements of another. These queries would return any posts having both the 'hobbits' and 'gandalf' tags. Postgres is awesome. The array extensions are magical. 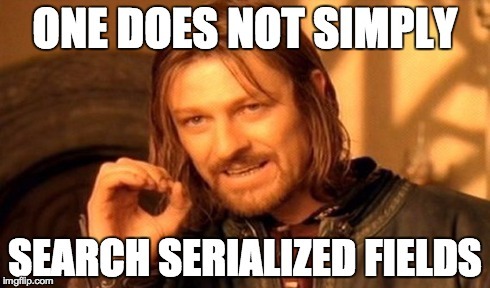 Instead of application-level serialization, let Postgres handle array persistance for you. It unifies the understanding of array-type data between the database and application and simplifies searching.